The dramatic increases in food prices experienced over the last four years, and their effects of hunger and food insecurity, as well as human-induced climate change and its implications for agriculture, food production and food security, are key topics within the field of agronomy and agricultural research. 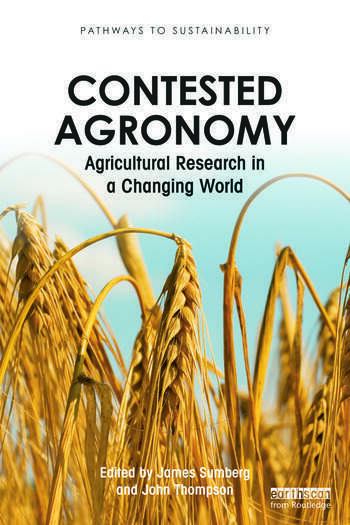 Contested Agronomy addresses these issues by exploring key developments since the mid-1970s, focusing in particular on the emergence of the neoliberal project and the rise of the participation and environmental agendas, taking into consideration how these have had profound impacts on the practice of agronomic research in the developing world especially over the last four decades. This book explores, through a series of case studies, the basis for a much needed ‘political agronomy’ analysis that highlights the impacts of problem framing and narratives, historical disjunctures, epistemic communities and the increasing pressure to demonstrate ‘success’ on both agricultural research and the farmers, processors and consumers it is meant to serve. Chapter 1. Contested Agronomy: Agricultural research in a changing world. Chapter 2. On heretics and God’s blanket salesmen: Contested claims for Conservation Agriculture and the politics of its promotion in African smallholder farming. Chapter 3. Conservation agriculture based technologies and the political economy: Lessons from South Asia. Chapter 4. Anthropogenic Dark Earths and Africa: A political agronomy of research disjunctures. Chapter 5. Contestation as continuity? Biofortification research and the CGIAR. Chapter 6. Water in African agronomy. Chapter 7. Understanding agricultural intensification on a forest frontier in Madagascar: Elements for a Malthusian/Boserupian synthesis. Chapter 8. Alternative configurations of agronomic experimentation. Chapter 9. ‘This field is our church’: The social and agronomic challenges of knowledge generation in a participatory soil fertility management project. Chapter 10. Contesting agronomy through dissent: Experiences from India. Chapter 11. Success making and success stories: Agronomic research in the spotlight. Chapter 12. Nullius in verba: contestation, pathways and political agronomy. James Sumberg is Research Fellow in the Knowledge, Technology and Society Team at the Institute of Development Studies (IDS) and a member of the STEPS Centre, University of Sussex, UK. John Thompson is Research Fellow in the Knowledge, Technology and Society Team at the Institute of Development Studies (IDS) and a member of the STEPS Centre, University of Sussex, UK.